No one can make this job fun, but we can make it fast! Easy data entry on the top of the screen, fast spreadsheet on the bottom, and IRS instructions on the right. 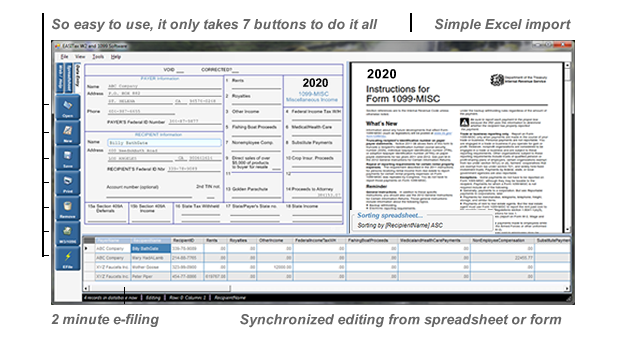 Seven buttons provide everything you need for editing, printing, and e-filing. EASITax reads and writes spreadsheet files and stores the data into a Microsoft Access database. Third party software and internal company systems interface with EASITax by either accessing the database directly or by simply creating a comma-delimited ascii (.CSV) file. Quicken, QuickBooks and Great Plains are just a few of the accounting systems that connect easily to EASITax. W2 - January 31st, 2019 is the filing deadline for ALL paper and e-file W2 reporting to the IRS and Recipients.